‘Mastering the Google beast’ isn’t as difficult as it sounds. In this series called Member Showcase, we publish interviews with members of The Oracles. 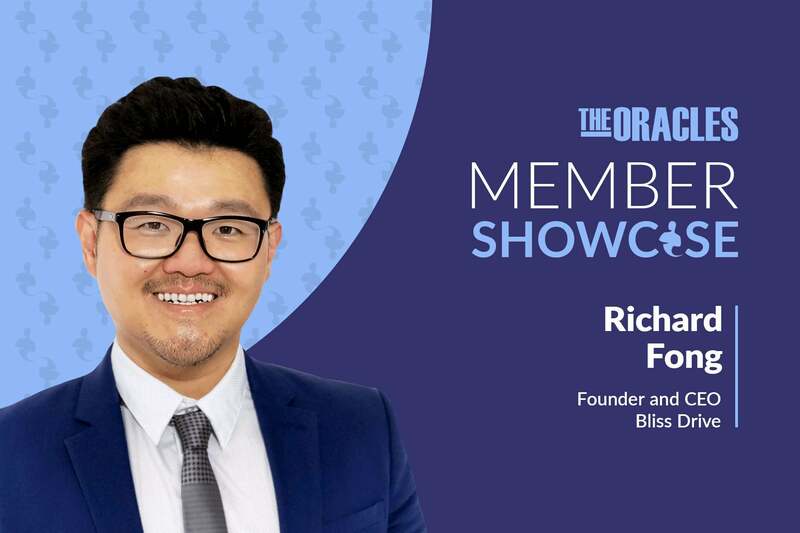 This interview is with Richard Fong, founder and CEO of Bliss Drive, a digital marketing, SEO, and lead generation agency. It was condensed by The Oracles. Richard Fong: My father. I admire his perseverance and dedication to our family. He journeyed to the U.S. from China when my mom was eight months pregnant with me. I didn’t speak to him until I landed in Kansas when I was eight years old. My parents struggled for years in the U.S., working at a restaurant during the day, learning English at night, and sleeping in the restaurant’s attic. Richard Fong: I’ve been dancing salsa and bachata for almost 10 years. I’ve performed on stage with dance teams at salsa festivals in Las Vegas and Los Angeles. I met my wife through dancing, which has been a life-changing passion. We don’t go out to dance as much now that we have a son, but we do break out some bachata moves after dinner in the family room. Richard Fong: I started working at a bank as a finance analyst right after college. It was a good job, and I got to travel all over the country. But I’ve always wanted to be an entrepreneur, so I learned internet marketing on the side and eventually made enough income as an affiliate marketer to quit my job. After I helped a friend with his website SEO, they got more online business in three months than the whole year before. That’s when I realized that I enjoyed helping entrepreneurs succeed more than pushing traffic and conversions to faceless corporations as an affiliate. Now I am able to use my strength and do what I love by strategizing and helping build life-changing systems for entrepreneurs. Richard Fong: Bruce Lee once said, “‎The successful warrior is the average man, with laser-like focus.” That has been true in my life. When I focus and concentrate on a particular result, it happens much faster than I anticipated. When I have too many projects going on, I feel scattered and stressed out. That idea also ties into my favorite book, “The ONE Thing,” by Gary Keller and Jay Papasan. The book asks the question: What’s the one thing you can do that will make everything else easier or unnecessary? What was your biggest challenge starting up? How did you overcome it? Richard Fong: Like most businesses starting out, I relied on word of mouth and networking. I eventually began getting inbound leads from the internet, but they were mostly smaller deals. I wanted to grow my business faster and get bigger clients. Jim Rohn once said, “Don’t wish it were easier, wish you were better.” I knew if I wanted things to change, I had to level up. If I kept doing what I was doing, I would keep getting the same results. That’s when I started learning about sales and prospecting. It took two years to get good at it. I still feel like a student, but I know how to go after bigger deals rather than wait for things to happen. Richard Fong: A great leader inspires others to do more than they think they’re capable of. This is usually because their vision and mission resonate with people so much. A great leader is also willing to sacrifice themselves for their cause. Mahatma Gandhi and Martin Luther King Jr. come to mind. Richard Fong: I look for qualities I can’t teach, like hunger, curiosity, integrity, and a mentality of always learning. You can train someone on technical skills and job roles. But if they don’t have motivation or ethics, they’re not likely to grow in my company. Everyone talks about hiring A-players, but most of them are already busy with something else. My goal is to create the opportunities and environment so an A-player sees a better long-term growth path in my organization than their current one. Which single habit gives you 80 percent of your results? Richard Fong: The most important habit I maintain is a daily journal of my ideas, goals, and priorities. It helps me organize my thoughts so they don’t weigh me down. Writing them down and prioritizing them frees me to do whatever is most important. I often improve my ideas because I am able to organize them and think deeply and logically about the process. That has helped me tremendously in my life and business. Richard Fong: I am developing a training course for entrepreneurs and consultants that explains SEO. There’s a great deal of data about how to get traffic from Google, which almost every business needs, but most of it is confusing and difficult to implement. I’m simplifying my 10 years of SEO experience so a non-technical person can understand it in four hours. If you know what metrics to focus on, the process is actually simpler than it sounds. Then you can outsource the work to an agency without getting burned in the process. The course will be available on RichFong.com and will help entrepreneurs master the Google beast. Richard Fong: “Bliss Drive” is a legacy I want to leave behind. “Bliss” means a state of profound satisfaction, happiness, and joy, while “Drive” means motivation to succeed. I loved hearing from a client how our marketing campaign turned around their stagnating business. They’re taking a vacation for the first time in years and have the money to buy a new car and give their son a drum set and lessons. That’s what Bliss Drive is all about! Connect with Richard on LinkedIn or the Bliss Drive website.